Loosen up or even eliminate minimum parking requirementsnow so available parking starts shrinking naturally over the next few years. This will also enable greater infill and density in cities as well as supply much-needed new housing stock. Tory Gattis is a Founding Senior Fellow with the Center for Opportunity Urbanism, and co-authored the original Opportunity Urbanism studies. Tory writes the popular Houston Strategies blog and its twin blog at the Houston Chronicle, Opportunity Urbanist, where he discusses strategies for making Houston a better city. He is the founder of Coached Schooling, a startup to create a high-tech network of affordable private schools ($10/day) combining the best elements of eLearning, home and traditional schooling to reinvent the one-room schoolhouse for the 21st century. Tory is a McKinsey consulting alum, TEDx speaker, and holds both an MBA and BSEE from Rice University. 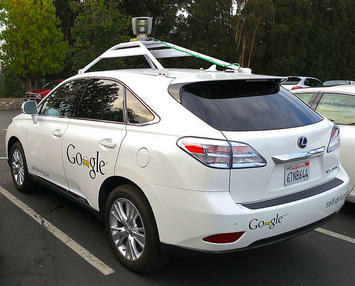 By Driving_Google_Self-Driving_Car.jpg: Steve Jurvetsonderivative work: Mariordo [CC BY 2.0], via Wikimedia Commons. Submitted by CapitalistRoader on Fri, 08/21/2015 - 20:41. Heavy vehicles—buses and trucks—cause the most wear and tear on the roads, not so much cars. Eliminating buses would help but perhaps to go from 75% utilization (according to Google) to 100%, those empty AVs could be utilized to deliver cargo. Just a thought. Car sharing might initially be along the lines of social networks today. You "friend" people who you're will to share a ride with. In addition I'm sure the car services will offer several levels of vetting. Non-vetted rides though could be in compartmentalized vehicles. Commuting now is "alone time." Non-compartmentalized car sharing would be a big step for most people. It might be a nice change for many. Watch for local Mothers Against Self Driving™ chapters to start springing up soon after AVs start to gain market share. City centers will be the first to ban self-driving, expanding out to the suburbs, until whole metropolitan areas outlaw self-driving except on Sundays between 8am and 4pm, for those "kooks" who drive for nostalgia's sake. The reduced carnage from automobile accidents will force politicians' hands to gradually ban self-driving. Submitted by davebarnes on Wed, 08/19/2015 - 15:06. 1. Commuter rail is doomed. 2. By 2060 it will be illegal for humans to drive cars in the USA. 3. More urban sprawl? People do love their acreage. Submitted by TD on Wed, 08/19/2015 - 08:46. If most people continue to commute at the same time how much of a reduction can that lead to in the number of vehicles? Your compartmentalized vehicles seems like they are high end self driving buses. Plausible I suppose as buses do take some cars off the road.